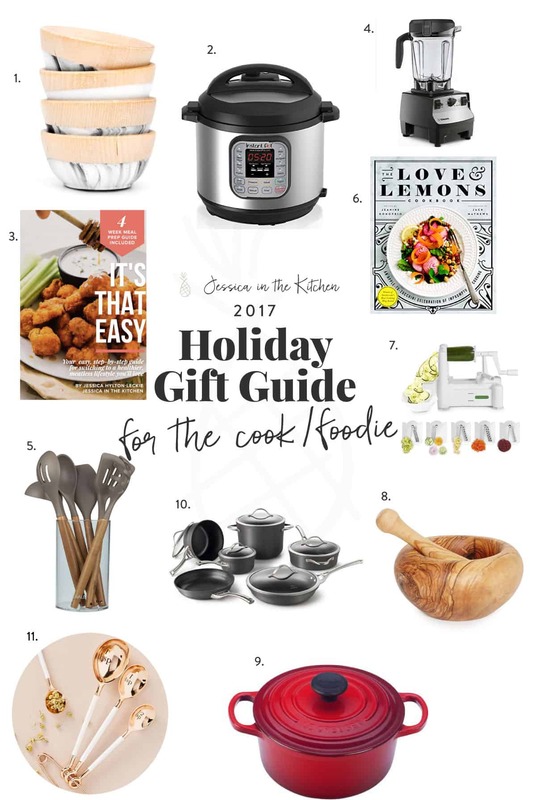 It’s here – Jessica in the Kitchen 2017 Gift Guides! 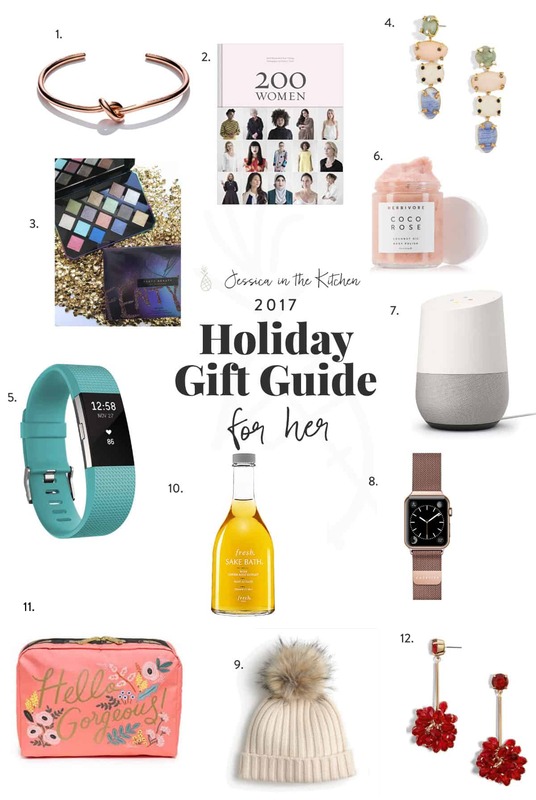 You can get something for everyone on your list, including gifts that give back! 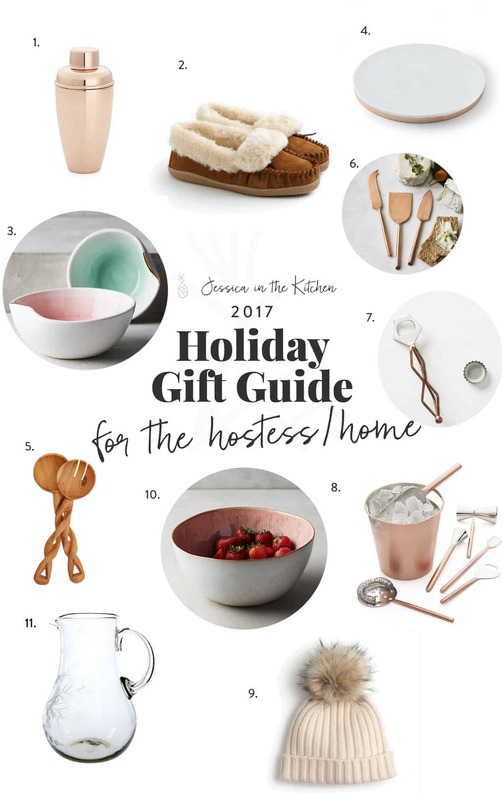 Welcome to the Jessica in the Kitchen 2017 Gift Guides! If you’re like me, you are DEFINITELY aiming to get some of those Black Friday deals in!! I’ve split the categories into a few that will more than likely cover everyone you’re shopping for. Also, I own a ton of these so I can testify to how amazing they are, and how much your gift receiver will love them. P.S. – TOTALLY acceptable if your gift receiver is YOU, btw. Like, you totally deserve a gift. I once wrapped a belgian waffle maker, addressed from me to me, put it under the tree, and happily unwrapped it then hugged myself for the awesome gift. Self-care at its best, friends. Dig in! Dive in! ENJOY!! Yes, I timed these so that they would come out right before Black Friday so that you can benefit from all the amazing sales going on right now. Speaking of which – check back tomorrow (on Thanksgiving) – my ebook It’s That Easy will be on SALE!! I’ll give you all the details tomorrow! 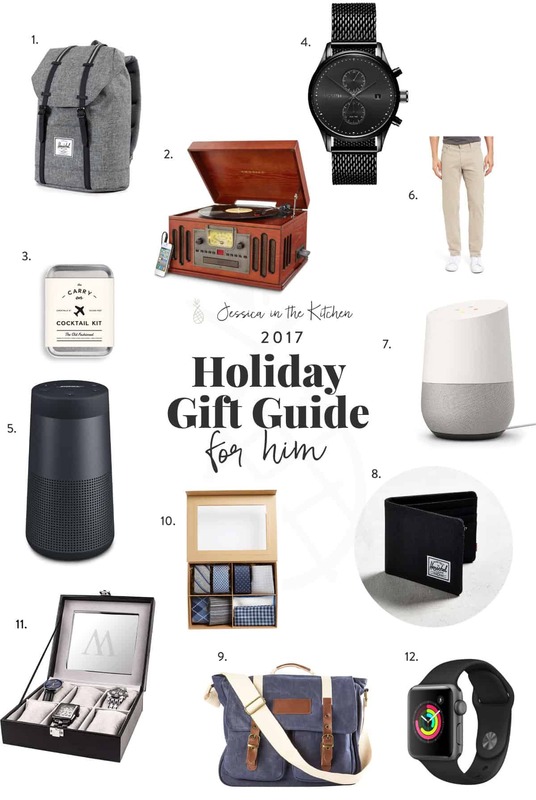 I hope these gift guides serve you well! They’re so fun to go through! Happy shopping and Happy Thanksgiving when it comes!! Dipped Mini Bowl Set – super cute, and I can totally see these being chic mixing bowls. 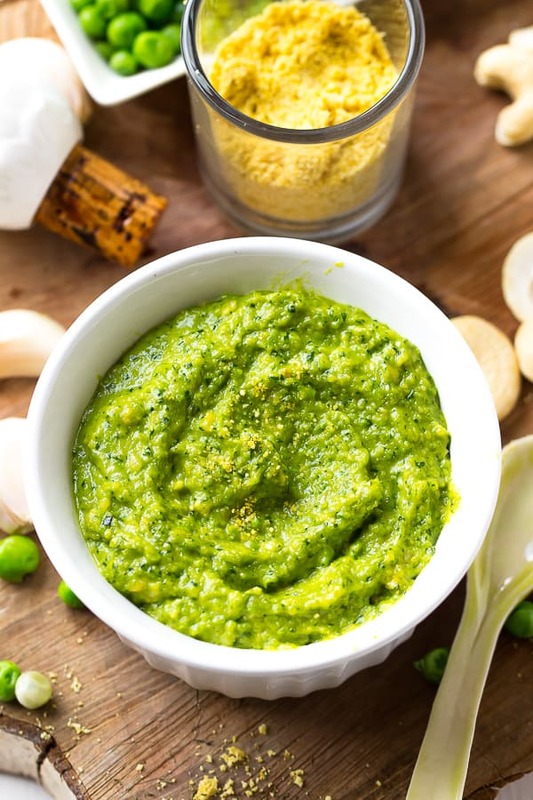 Instant Pot – I mean, who doesn’t want this?! IP recipes coming in 2018 friends! It’s That Easy Ebook – My e-cookbook! Great choice, just saying. Vitamix Blender – a high speed blender will change someone’s life – excellent choice. Non-stick Bamboo Kitchen Utenstils – we recently swapped all plastic for bamboo & silicone. Best. decision. The Love and Lemons Cookbook – I LOVE this cookbook!! Spiraliser – the most fun kitchen tool, and SO helpful! Olive Wood Mortar & Pestle – I just got this and it is so pretty, oh, and incredibly useful too! Le Creuset Signature Round Dutch Oven – the best for a roast, stew or even baking bread! Calphalon Contemporary Nonstick 11 piece set – this is our set and we LOVE it. It’s so durable. Delaney Measuring Spoon Set – I just got these and oh my HEART! So pretty *and useful*. This Works | Stress Check Breathe In – perfect for calming you down, and checking in. Luna 2 Facial Cleansing Brush & Anti-Aging Device – This brush gets in deep, and really purifies. Getting Pizza Gym Bag – uh, YES. This is cute and also very true. Whole New You: How Real Food Transforms Your Life, for a Healthier, More Gorgeous You by Tia Mowry – I absolutely love this cookbook!! 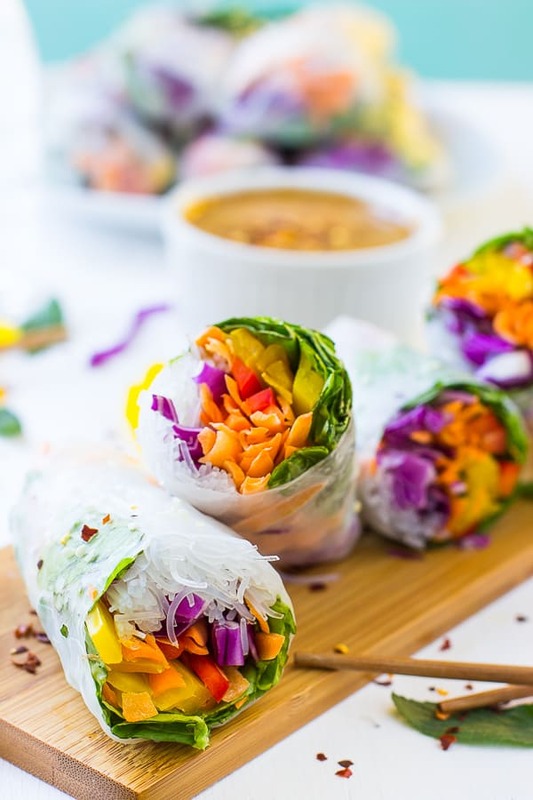 It’s filled with delicious recipes that are so healthy and good for you. Coco Rose Coconut Oil Body Polish – My FAVE body polish. I’ve replaced it so many times <3. A subscription to Headspace – this is my fave meditation app. Helps with calm, peace and happiness. Fruit Infuser Water Bottle – chic, cute and will change the way you see hydration!! The Universe Has Your Back by Gabrielle Bernstein – currently reading & this book is changing my life! The Reversible Mat 5MM – My favourite yoga mat. Durable, travel friendly and gorgeous. Peppermint Soaking Salt – we all deserve a salt soak this holiday season. Smells amazing. Ominihome Essential Oil Diffuser – yes, this will be a gorgeous and soothing gift for sure! Stainless Steel Cocktail Shaker with Copper Finish – we have this and it’s stunning. Goes with everything, too. Women’s Lodge Mocassins – Comfy, faux fur, and will go with everything this holiday season. Mimira Nesting Nut Bowls – have these, LOVE them. Can you see ALL nut mixes going into this?! Marble & Copper Round Board – Seriously, a round cheese board is an ingenious idea. Twisted Wood Salad Servers – I LOVE these serves. The most beautiful handles, ever. Copper Cheese Knives – everything should be copper. There, I said it. Trapeze Bottle Opener – this is the world’s coolest bottle opener. I mean, I know I would carry it everywhere. Copper Bar Tool Set – again, copper magic. Also. this tool set works really well. Ribbed Beanie with Faux-Fur Pom Pom – ridiculously cute! 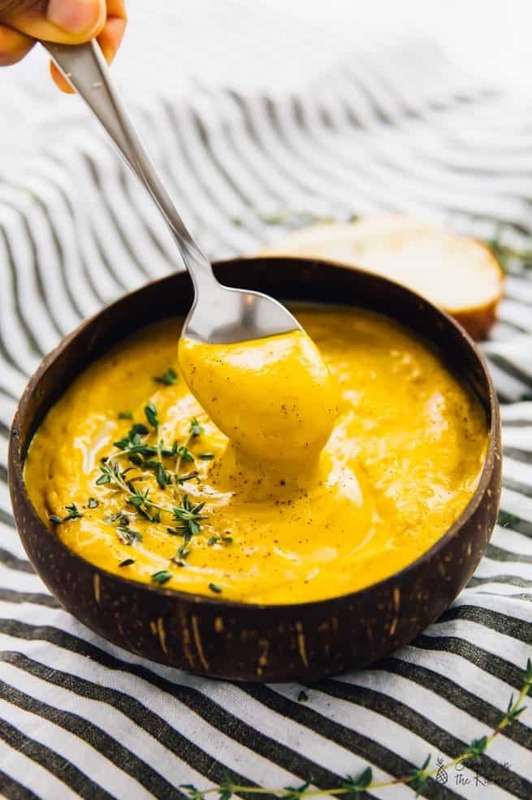 Perasima Serving Bowl – this bowl has my heart!! LOVE that inner colour, too. Clear Round Glass Pitcher – gorgeous, engraved, and super practical for all those holiday drinks. Okay, this category was really important to me. 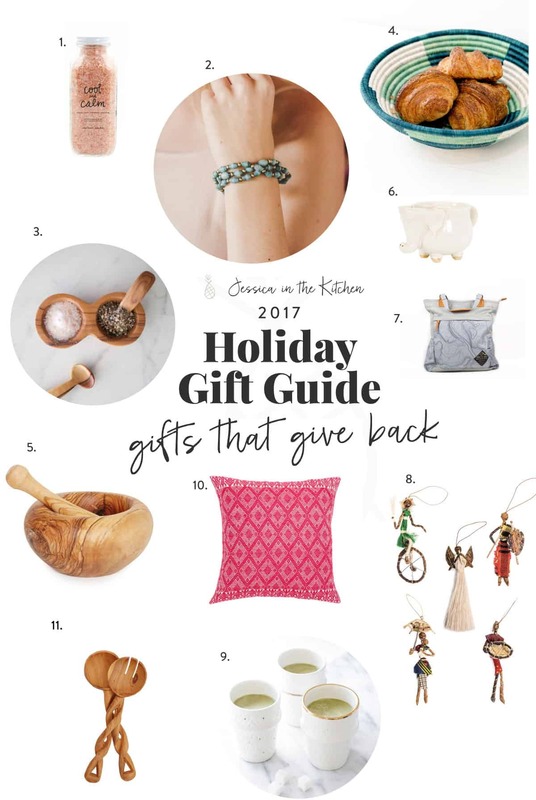 By purchasing one of these gifts, you are giving back directly, via fair trade, to the makers who created these products. In some cases, a purchase helps to send a girl to school, clear away trash from the ocean, and enable financial support for the amazing makers of these products. You may noticed that I mixed them into other categories to show how versatile they are! Peppermint Soaking Salt – smells AMAZING!! Sonia Bracelet – I got a bunch of these to give out. They’re so pretty and go with everything. Salt & Pepper Set – Excellent quality and so useful for cooking with families and for parties. Large Paradise Bowl – These bowls can be used for anything, and are so durable and an eye-catching. Olive Wood Mortar & Pestle – Again, love this mortar & pestle. Beautiful quality and so useful. Elephant Mug – isn’t this the cutest mug EVER?! United by Blue Tote – great for unisex, and so portable! Sisal Ornaments – These were sold out when I wanted them, so hurry for these! The most beautiful ornaments. Moroccan Ceramic Cup – These were sold out too but are back in stock! A multitude of uses for these stunners. Handwoven Chiapas Woven Pillow – I want this pillow in EVERY colour. Twisted Wood Salad Servers – definitely my favourite salad servers. So, SO pretty. Love Knot Bangle in Rose Gold – I want this, everything wants this, SO pretty! 200 Women: Who Will Change The Way You See The World – a total badass book that’ll inspire. FENTY Beauty Galaxy Eyeshadow Palette – I HAD to include a FENTY beauty item. STUNNA (get it?!). Devina Drop Earrings from BaubleBar – These earrings + the holiday season = perfection. Fitbit ‘Charge 2’ – I was so fortunate to be gifted this and I can’t wait to use it!! Also, water-resistant!! Coco Rose Coconut Oil Body Polish – Again, my favourite body polish everrrrrr. It’s like buttah. Google Home – everyone needs one of these. Apple Watch Strap – If you know someone with an apple watch, they’ll LOVE this strap. Ribbed Beanie with Faux-Fur Pom Pom – again, the cutest beanie ever. Rice Sake Bath – OMG. Add this to a bath, and it’ll calm down all nerves. An amazing gift, and lasts forever. Cosmetic Case – Isn’t this the cutest case ever?! Also, it comes in every pattern imaginable. Noel Drop Earrings – I NEED these for Christmas Day!! They come in tons of colours, too! Herschel Supply Co. Retreat Backpack – my husband LOVES Herschel! This would be great for all uses. Crosley Musician Turntable – I just got this for my dad, and trust me, it’s an amazing gift (for men or women)! Carry on Old Fashioned Cocktail Kit – I mean, doesn’t this just look so cool?! MVMT Voyager Chronograph Mesh Bracelet Watch – My husband has an MVMT watch and raves about it. Bose Bluetooth Speakers – BEST. You’ll feel like you’re acoustics heaven! Twill Pants – love all the colours available! Google Home – again, everyone needs one!! Herschel Supply Co. Roy Bi-Fold Wallet – A great slim fit and super stylish wallet. Monogram Messenger Bag – LOVE this messenger bag, so much. The Tie Bar Large Style Box – Ties are needed, and these are gorgeous! Monogram Watch Box – I bought a similar one for my husband, and it’s a great gift! Also, a real stunner. Apple Watch Series 3 – You know this was coming, didn’t you?! My husband uses his Apple Watch every three seconds. 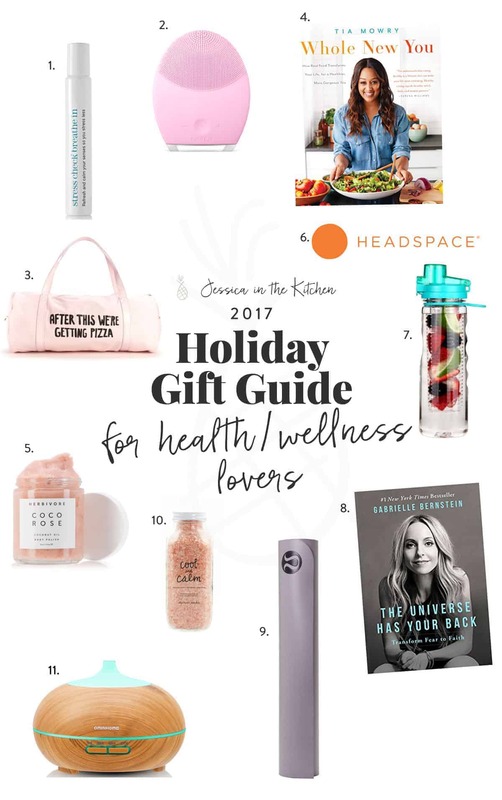 Definitely a great gift for someone who wants to keep up on fitness, sleep, goals…everything! What’s you’re favourite item, and what do you plan to get?! Let me know in the comments below friends! Gap – 50% off! Oh my heart, I need to shop this sale. I love how cozy everything Gap is! 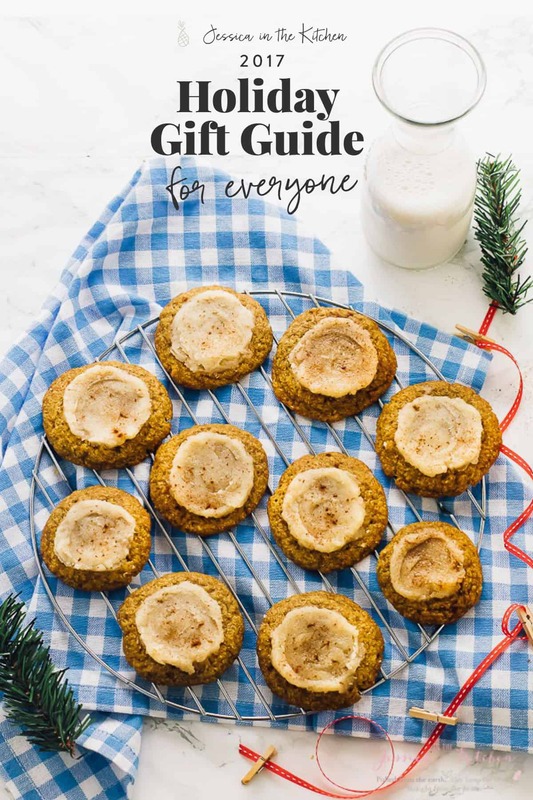 My ebook, It’s That Easy – 30% off!! Starts tomorrow! USE the CODE FRIDAY30. Shopbop – up to 75% off sale items! Crate and Barrel – 15% off full priced items! Kate Spade – 30% off your order! Kate Spade is my favourite brand, ever. Every thing from my desk is from them, and I love their stationery products and clothing. J. Crew – 40% off your entire order! Half my closet is from J.Crew (The other half from Gap!). Totally in love with their entire store.